Brand new and delicious, Honeyberry will give you bumper crops and year-round interest! Dark-blue, strange-looking, elongated fruits in abundance from this summer onwards. The sweet, juicy fruits have a melt-in-the-mouth flavour that is similar to blackberries! Supplied as 3 established plants in 9cm pots. Self-fertile. Completely winter hardy. Now you can pick this brand new and delicious summer superfruit from your own garden! This amazing Honeyberry is a type of sweet honeysuckle produces some of the healthiest fruits around, and best of all they taste great! The sweet, juicy fruits have a melt-in-the-mouth flavour that is similar to blackberries, with a hint of kiwi! They are rich in super-healthy vitamins and minerals, and contain even more antioxidants than blueberries! Simply wonderful in sauces, puddings, jams, jellies and desserts, you can even pick them straight from the bush for a yummy, healthy snack. 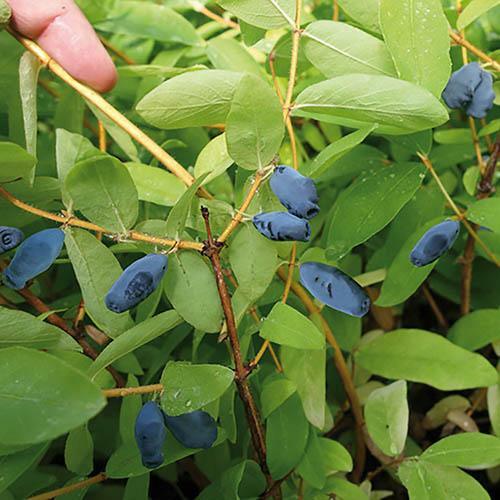 These unusual and interesting additions to your fruit garden are self-fertile, and will produce their dark-blue, strange-looking, elongated fruits in abundance from this summer onwards, giving you bigger crops each year! Whats more, they have gorgeous berries and elegant, mid-green foliage, and they will look great in patio pots!